A clear bubble top arcade cabinet joystick with 5pin Joystick Cable and 12V Power Cable that can be operated as an 8 way, 4 way or 2 way joystick. 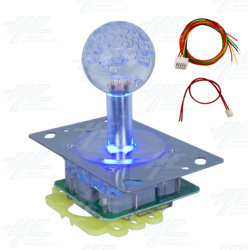 It is compatible with most arcade machines and connects to 12 volts to illuminate the Joystick. The joystick contains an LED bulb for an multi coloured illuminated effect up to 7 colours; Red, Green, Blue, Yellow, Aqua, Purple and white and features 2 colour rotations speeds.